On the 4th of July, I rode from Morzine to Bellegarde-sur-Valserine. The day had a few notable highlights, mostly of the maintenance-kind. On my brief foray into Switzerland, I passed a bike shop and was finally able to replace my rear tyre! When I arrived in Bellegarde, I was in time to see the town of Aigues-Mortes on the telly, which I'd last seen up close and personal, on the 23rd of June. It also looked nice from ground level! 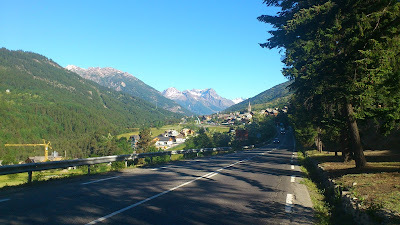 The 5th did not start well, the previous afternoon's internet troubles persisted, and the hotel breakfast was more aimed towards drivers than tour-stage-cyclists. In a brief moment of connectivity, I discovered that Oli's dear wife Julia had got a job at Wellington Hospital, which was great news and long overdue. While web-browsing was nigh on impossible, bizarrely skype was working, so I did manage to talk to Kaitlyn and also Sarah. 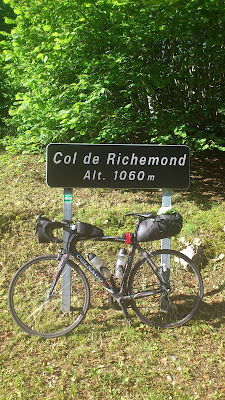 I hit the road just after 0730, and was soon into my first climb of the day, the Col de Richemond. Despite asking Katy to ring Julia, I called her myself, and was quite happy just to leave a message. My legs didn’t feel at all strong, but I adequate power to get myself up the hill. A can of Orangina from village at the bottom probably helped. On the other hand, the two bananas I'd stashed in my pocket were temporarily slowing me down. A memorial stone to locals who'd died in WW2. Their ages had a profoundly sad effect on me. 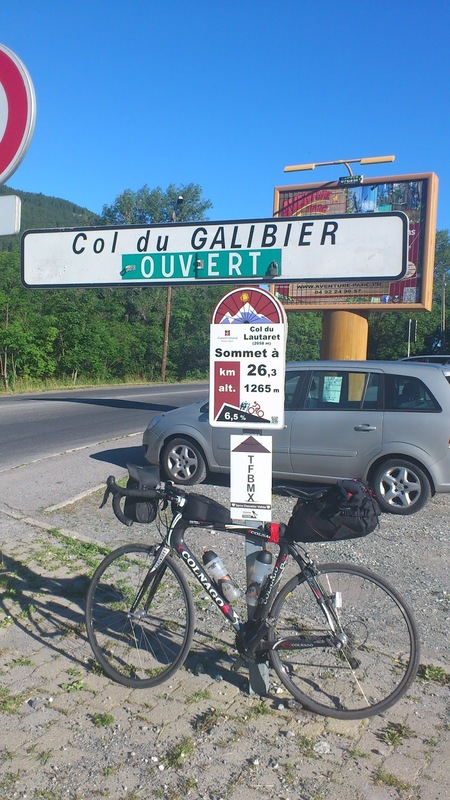 I took the signposted route up the Col de Grand Colombier rather than the one I'd mapped. I was looking forward to the descent, having seen spectacular imagery from Stage 10 of the 2012 Tour - the peloton rode in the opposite direction to mine, and the sight of them snaking their way up a sharp ridge compelled me to find a way to include this stage! 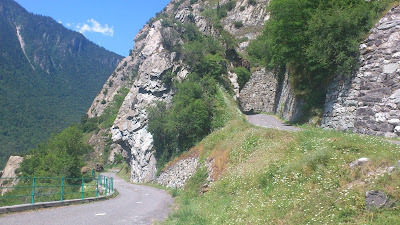 The climb was steep at the bottom, but had 3km of virtually flat road half way up. When I got onto the race route, I saw I'd just missed climbing a 19% ramp. I presumed it was short, and was mildly tempted to check it out, but thought better of it. Very cool to see roads occasionally closed to all but cyclists. "2nd Saturday of the month, from June to September, 7am to 3pm". 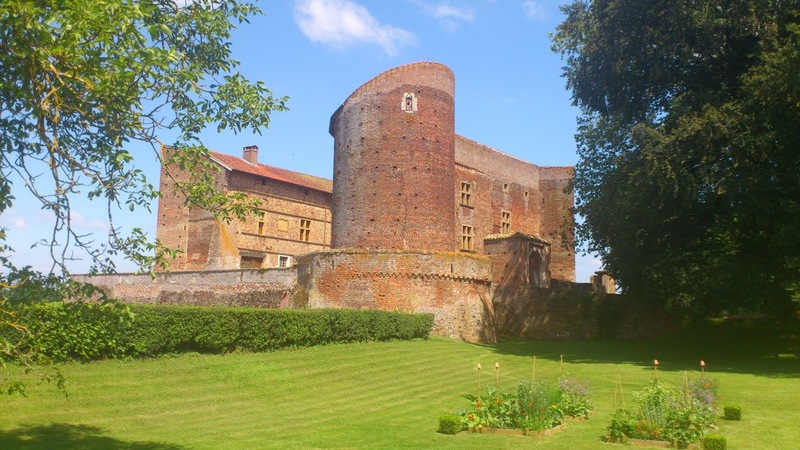 Chapeau, France. The last few kilometres were steep too, and out in open. From the summit, I could see the Rhône - a river I'd crossed the day before only a few kilometres old (out of Lake Geneva), and which I had also ridden along near its terminus at the Mediterranean. There were strange clouds over it, and I wondered if I’d soon get wet. I was excited about the descent! It was steep initially, and then flattened out. I was very lucky to catch “Kiwi” written on the road, and reeled the bike in. 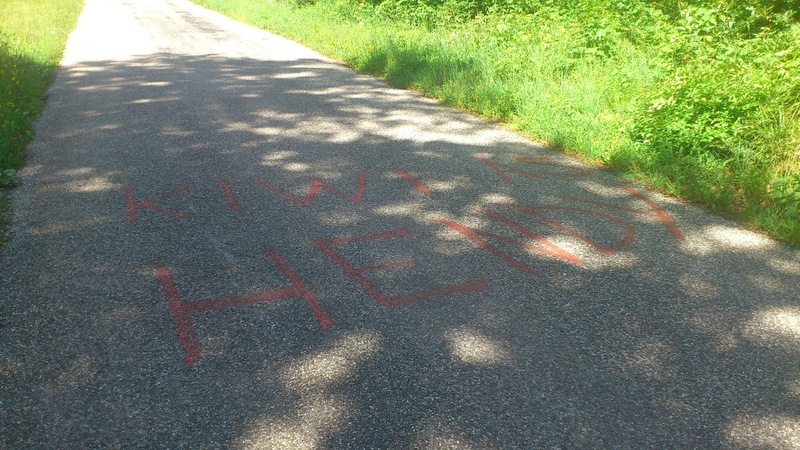 When I got back to it, the full text read: “Hendy, Kiwi As” in honour of Greg Henderson, who'd ridden his maiden Tour de France in 2012, and would have had to grovel up the road I was currently blasting down! ... views of the sinuous section of road were elusive. That didn't stop me from enjoying the ride, mind you! I stopped at Culoz, and found a bakery just adjacent to a roundabout where an accident had just occurred. I couldn’t see anyone hurt - indeed, I couldn’t even work out who had been riding the scooter which lay on the road! The Gendarmerie appeared quickly, but were gone again within a couple of minutes. When a couple of guys who'd been smoking outside asked how much my bike was worth, I decided to make my getaway while I still could! From Culoz, I was pretty much straightaway onto the Col de la Lebe. It was a really nice climb, and obviously not as stern as the HC or Cat.1 mountains. 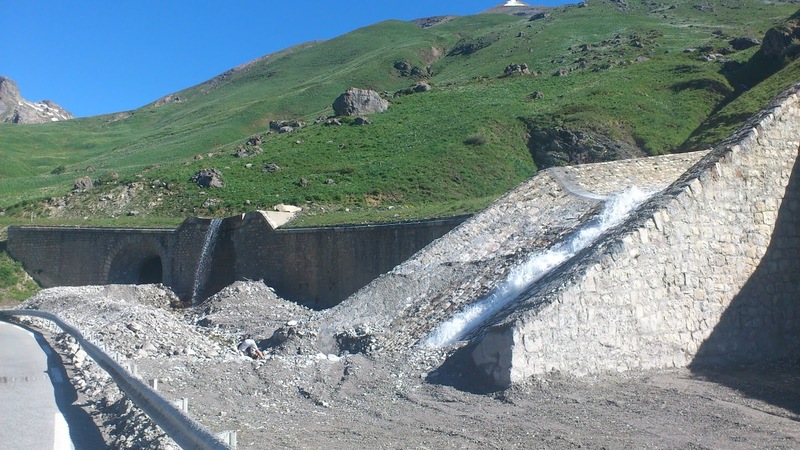 After the Col, the road stayed high for a long time. By this stage the roads were very quiet - in the 12-2pm period, I guessed everyone was at lunch. I stopped at the Carrefour in Hautville-Lomptes and went straight for a slice of what had become my favourite sweet treet - Flan! I also bought some tuna sandwiches. And, a takeaway 15-pack of viennoseries! 5 each of tiny croissants, pain au chocolat and pain au raisin. I ate some immediately, but later realised I should’ve waited – they were much better having had a bit of time in my pocket to warm up! After burning off most of my elevation, I then enjoyed a long false flat, by virtue of doing it in the good direction. I noticed my legs were feeling really tired, and I had no strength. 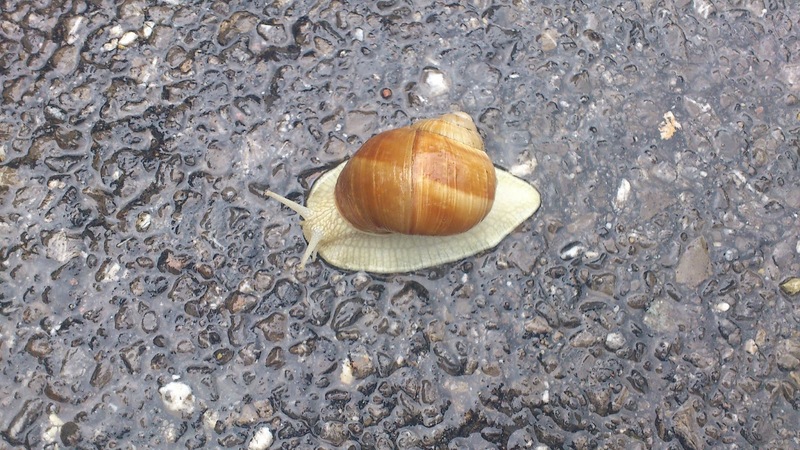 But, I was OK tootling along. Stop for coke about 20km out from my destination, which surely helped. 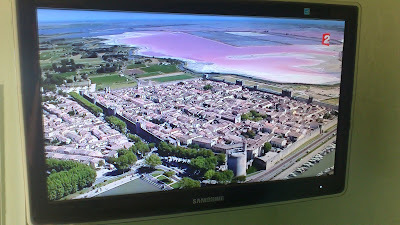 I had a bit of a nightmare finding the Ibis Budget Sud in Mâcon, only for it to be full. That necessitated a stop at McDonalds, where I took advantage of their WiFi to find an alternative. That done, I was there soon after, showering and doing my laundry. Dinner was a mozzarella and tomato salad, mushroom risotto, tiramisu, fromage-blanc – very nice with a bit of sugar sprinkled on it. I even got to the end of meal and didn’t feel sick! I would need to get used to smaller dinners again or else I’d be in trouble. On the way up the Col de la Lebe, I'd asked myself, “Why don’t I miss anything? ", conjecturing that it was some sort of self-protection mechanism. Despite not, I was still very much looking forward to getting home. Highest on the list of anticipated activities was family mountain bike rides (before our family was one)! 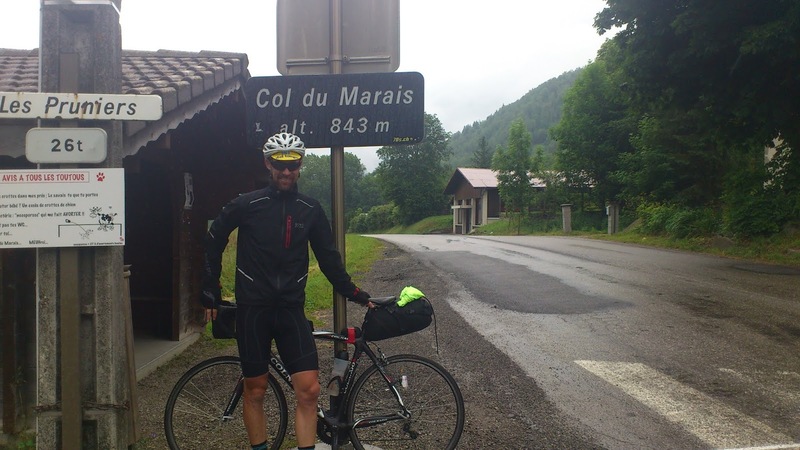 206km ridden, 3140m climbed, 11 hours elapsed. Three decent climbs, not used in the tour, but probably Cat.1 or Cat.2. After the previous day's baking sunshine, it was still a disappointment to wake to drizzle. The kids didn't have school today, so we all had a slower start than yesterday’s 7am. Silas made coffee and porridge again, and then omelettes! 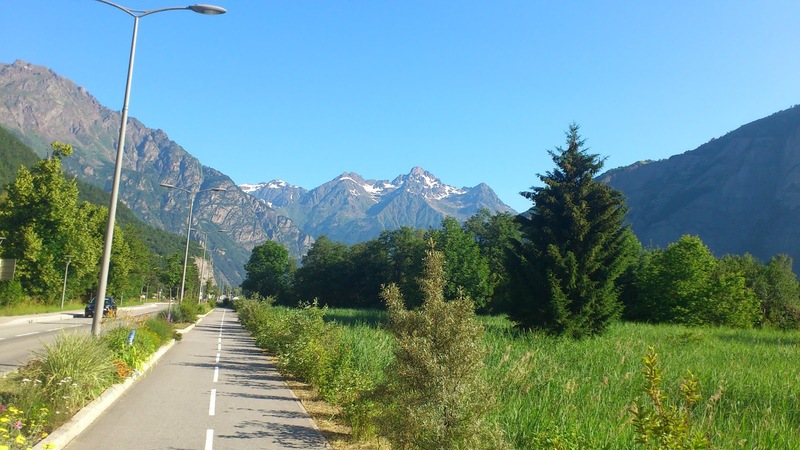 After saying goodbye to Ange and kids, Silas and I rode out together, after a quick stop at a boulangerie for some supplies, we rode back towards Faverges (at the base of Col de Tamie that Silas and I had ridden together after the Madeleine), mostly on amazing cycle path. A friend of Silas passed us and we sped up to ride with him for a bit. 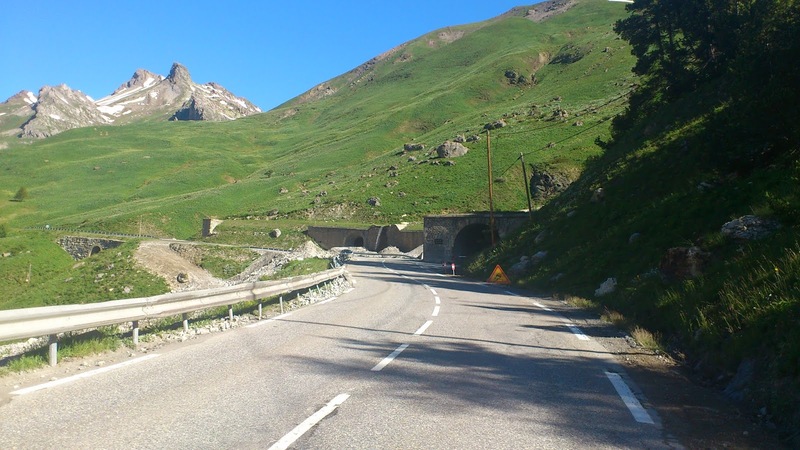 Once he turned off to do the Col de la Forclaz, we continue to the Col de l'Epine - I'd be completing the 2013 Stage 19 route that I'd started a couple of days earlier from Le Bourg d'Oisans. 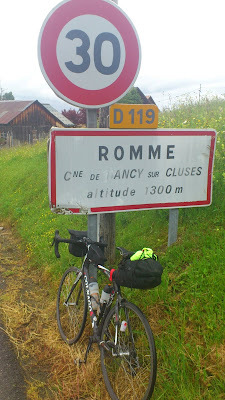 We ignored the “Route Fermee” sign, and later chatted to guys doing tree work as we pass. There was no closure sign at the top, and besides, the workers hadn't seemed bothered. I didn't much enjoy the wet descent. That was followed by a small climb and we stopped at the sign there for photo - it was a bit of a novelty being in the shot with my bike! The next descent took us almost as far as Thones, just up the road from my old friend, Dingy-St-Clair. At the base of the Col de la Croix Fry, I farewelled Silas, and continued on my own. Slowly!! 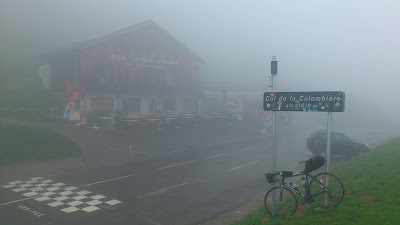 The Cat.1 climb took me just over an hour, and was followed by a cold descent into La Clusaz. I made a stop there, and bought a hot dog (of all things!! ), two hot chocolates and some sweets. Variation often comes at a cost, and this was in the form of some crazy hot mustard which made the American-style vittles unenjoyable to eat. 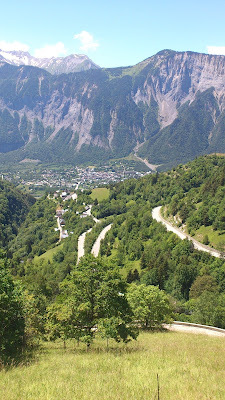 The descent continued through to Le Grand Bornand, which was where the upcoming stage would end. I was wet, and getting cold, so stopped in town to put my undershirt on. Unfortunately, that involved getting half naked on the main drag, but it was worth it for the additional comfort. 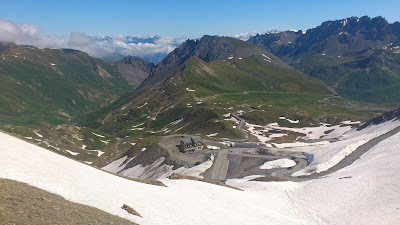 The Col de la Colombiere was another hour-long climb, and after a brief photo stop at the top, got stuck into a beautiful, but nervewracking descent. For the most part it was wet, and the road looked slippery, whether it actually was, or not! Near the bottom, I met two German cycle tourists and had a half-decent conversation in German - probably my first legitimate one since my sixth form days (Year 12 in the new-money)! 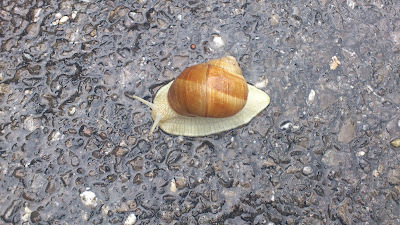 Why did l'escargot cross the road?! At the bottom, I was frustrated to realise the route I'd mapped took me straight onto another climb. The climb was nice enough, but it was annoying to get regular views of the parallel route down in valley. 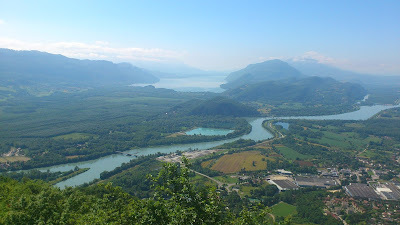 On the other hand, the views near the top were fantastic. There was a loud concert on in Cluses, and the sound reverberating off the steep valley walls was a highlight of the descent. I stopped at a supermarket for cheap pain au chocolat, pain au raisin, and 1.5L of OJ. I've discovered that the Lidl supermarket chain is very cheap, but always has very long queues (go figure!)! Nervous about my worldly possessions "locked" outside, I leave half the time without buying anything. 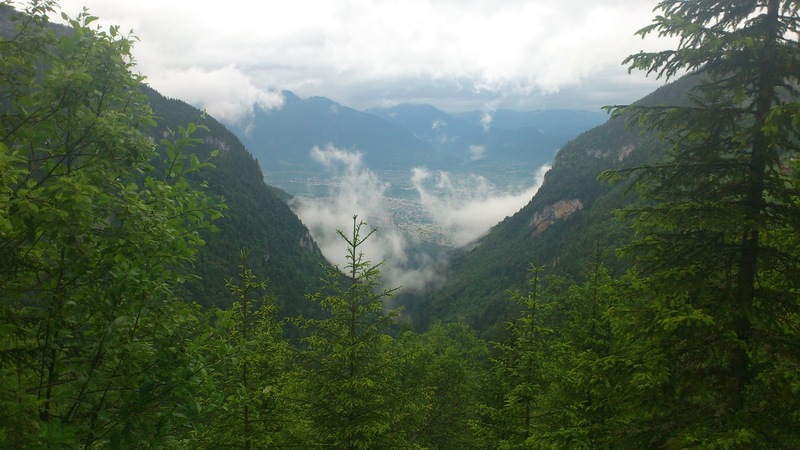 There's a short climb out of Cluses to cross into the next valley. I jump on a closed road – on account of about 50m of resealing – and enjoy 6 luxury-kilometres on my own. 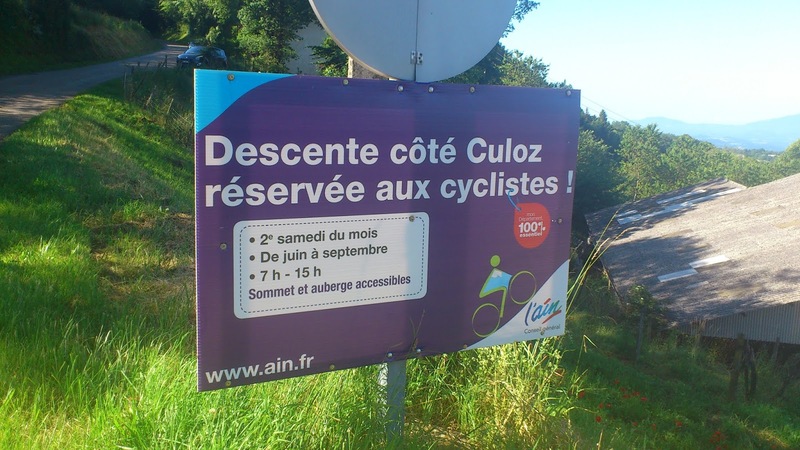 After crossing the river, the road takes me as far as Samoens, and I take the first sign-posted route onto the Col de Joux Plane. It was raining on and off on the way up, and I just rode quietly. My legs were feeling pretty thrashed, and I was in no mood to add insult to injury. The rain got torrential at the top but adding my hood under my helmet made a good difference. 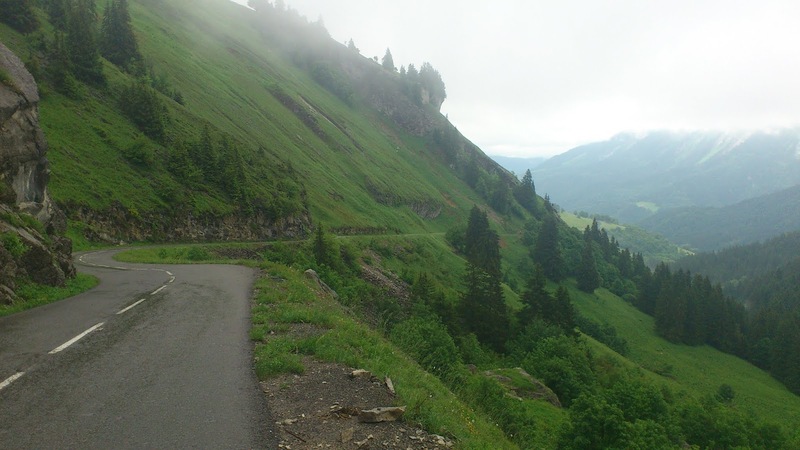 The descent into Morzine was tight and twisty, and didn't burn off all of the 1000m elevation gained on the climb. 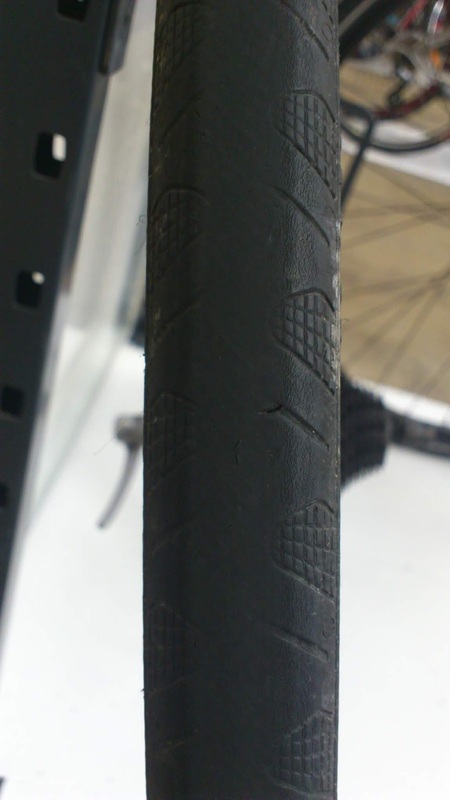 While low speeds prevented me from getting too cold, I definitely burned through a decent amount of brake pad! 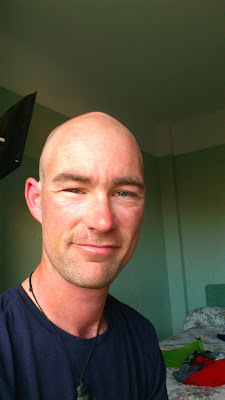 It took a few minutes to find my hotel, but despite arriving wet and bedraggled, I received a warm welcome and was soon enjoying hot, long shower. By the time I'd finished hanging my wet clothes all over room, there was hardly room to move! I'd hoped to meet Wellingtonians Steve and Nessa for dinner, but learnt that Steve had come off his mountain bike, necessitating stitches and preventing socialising! I couldn't bring myself to put my wet shoes on, and walked across the road in bare feet. I passed a very full restaurant, before going back to it - figuring it must be good. I ordered a half-litre pitcher of wine – far too much as it turned out, a glass would have been more than enough. On the other hand, I did score the best carbonara I'd ever had – an egg yolk came in a side dish, and I was to mix it in myself. The pizza which followed was a little too much, and my leftovers were put into a doggie bag for me, and made a very good snack the next day. Foolishly, I ordered chocolate mousse, and felt very sick on the way back to the hotel. 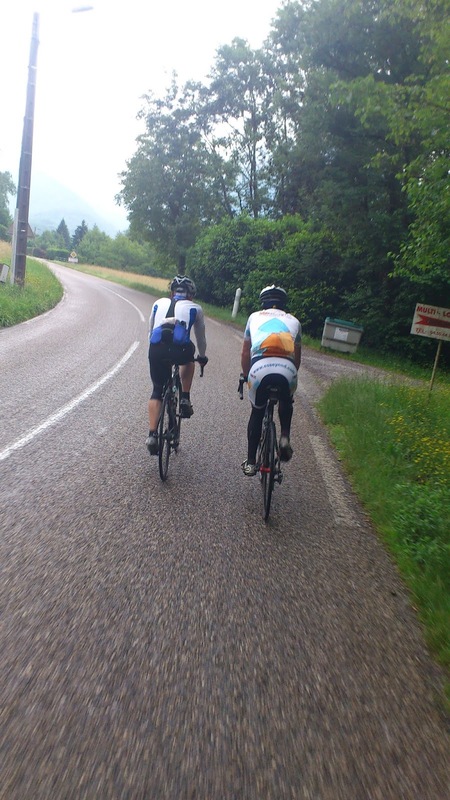 The next morning's ride was a transfer through to Bellegarde-sur-Valserine. 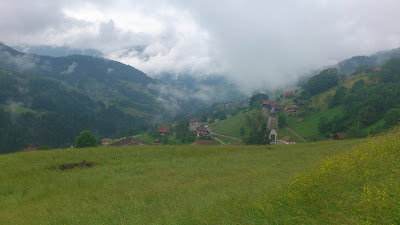 I'd originally intended to stay in Le Grand Bornand, but the invitation to stay with the Cullens was too good to miss. 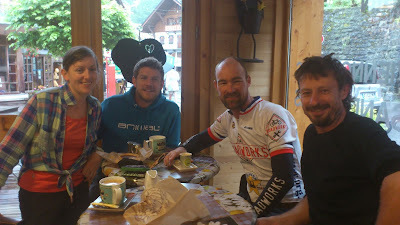 The day started on a great note, with a lovely social occasion - coffee with Steve, Nessa, and Mike the Hippy. Stage 20 of the 2013 Tour would be starting and finishing in Annecy, necessitating a last-minute call to check out the stage myself. I mean, why not?! Silas made porridge, but I should have had seconds! I stopped at the supermarket in the Cullens' village for bananas, apricots and bread, then rode around the lake to Annecy. Once past the town, and on the stage route, I stayed on a cycle path parallel road the peloton would be using. I caught a nice old dude also out for a ride, and we got to chatting - he lives in New Caledonia half the year, and Annecy the rest. Unsurprisingly, he seemed pretty happy with his lot! 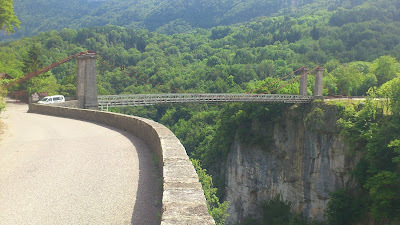 Eventually, my turnoff came for Cote du Puge, the first Cat.2 climb of the day. It was already very hot, and my legs not feeling super. 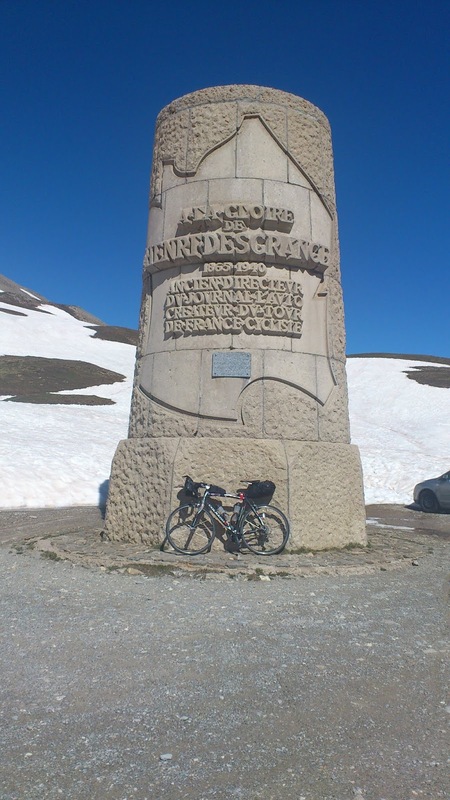 I seemed strangely focussed on time and progress, and despite leaving all my luggage at Silas and Ange's the bike didn't feel supercharged like it had at the bottom of Alpe d'Huez. The locals really get in behind the Tour! I stopped a couple of times at in St Jean d’Annecy, once at a boulangerie, and again at a coke machine. 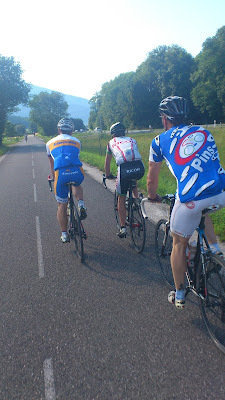 A series of three Cat.3 climbs took me through to the base of the Cat.1 Mont Revard climb. I stopped at a shop near the bottom, and after watching a young boy eat an ice-cream, and to go back in for one myself. This area looked to be home to skiing in winter, but at this time of year, paraponting seemed to be the activity of the day. 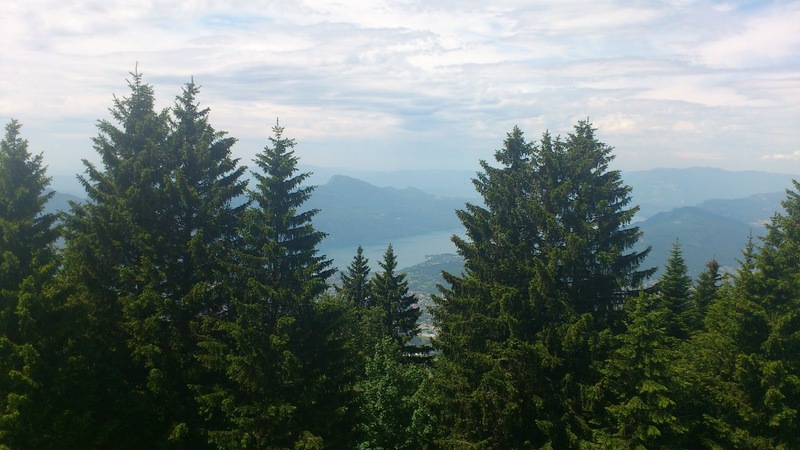 After summiting, I enjoyed a long descent, followed by a lumpy road through to Quintal. 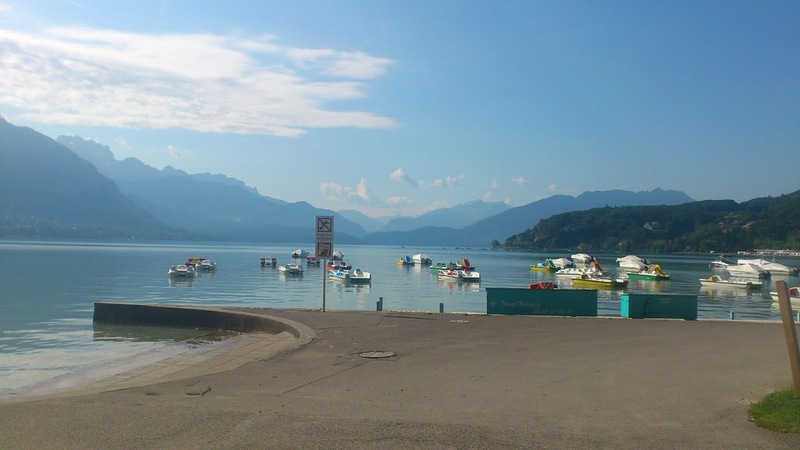 Occasionally, I would catch glimpses of the Lac du Bourget, on whose shores Aix-les-Bains sits. 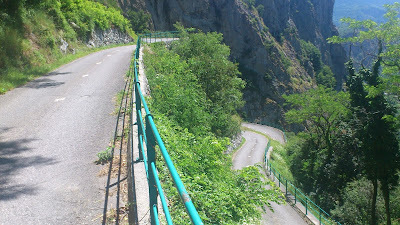 The road crossed a very deep gorge. The tar on bridge surface was totally melted! My legs were also totally melted by the time I hit the final HC Semnoz climb. Many of the kilometres were steeper than the 10% gradient which I'd identified as the tipping point between manageable and hard. As a result, I spend most of the climb out of the saddle. 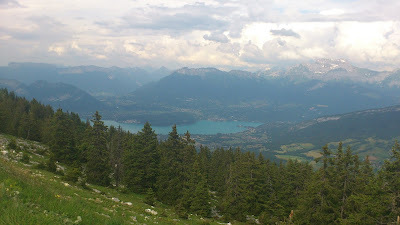 Near the top, I resorted to very slow and laboured pedalling while seated. Rough on the knees, but effective enough. 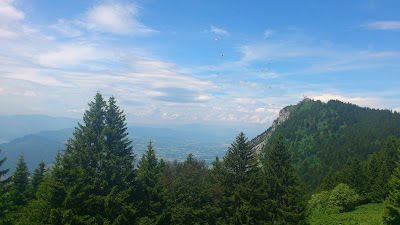 At the top, I grabbed yet another coke, and finish off a pack of Nutella crepes I'd bought earlier. 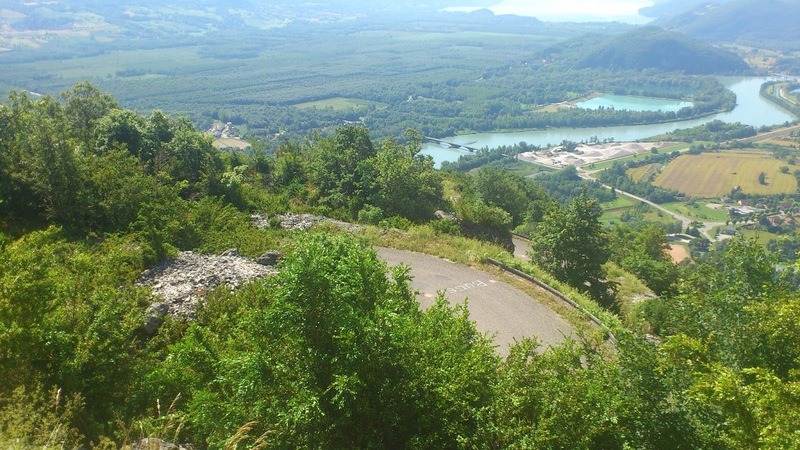 Befitting an HC climb, it was a nice descent to Annecy – initially retracing the route I'd taken up, but a new road on the lower half. I was glad I'd carried my vest - despite the very hot day, it good to be able to throw it on for this. 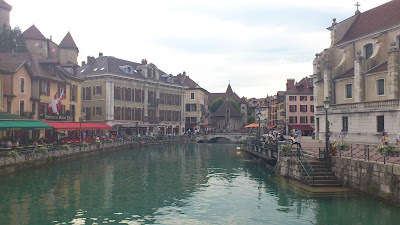 I had to pass through Annecy on my way home. The lake front looked like it had been busy, with the last of the sunbathers packing up. I'd arranged to meet the Cullens in Dingy-St-Clair for dinner. This necessitated a climb over the Col de Bluffy. Luckily, this wasn't too large a climb, but I did take a wrong turn over the other side, and and ended up riding a 1km climb which turned out to be a dead-end. Paying more attention to signage on the second attempt helped. There was no sign of Silas at Dingy, so I fired up my phone (which had been in camera mode all day long) to find a text message from Silas with a change of venue. I retraced my steps, minus the dead-end, and was soon back at Silas’s. As I walked in, a familiar woman leapt up immediately, and said “Hi, I’m Sarah”. I didn't say outloud "DUDE, I know who you are, I got up in the middle of the night to watch you win the Gold at Athens!!! And I woke my family up with all my whooping and hollering!" She was every bit as lovely as she seemed on the TV, and both she and her partner seemed very interested in my trip. Subconsciously, I must have really enjoyed talking about it – as I lay in bed a couple of hours later, I realised I was excited about getting home. 182km ridden, 4660m climbed, 10h15 elapsed. 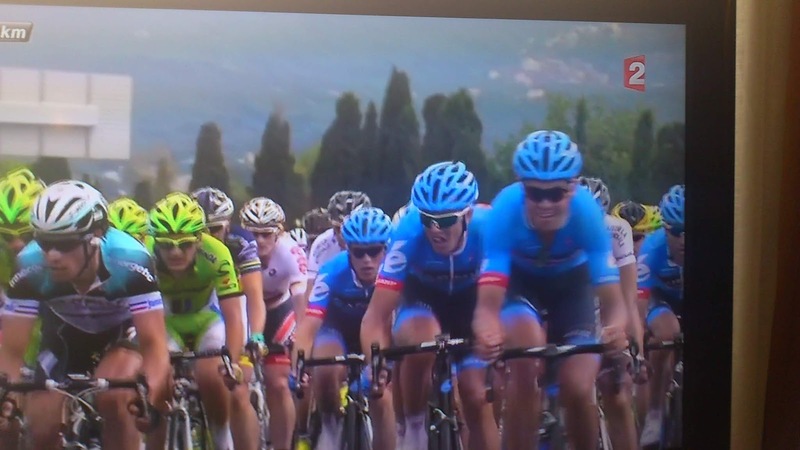 Three Cat.3, and one each of Cat.2, Cat.1 and HC climbs. None of which I'd planned! I started the day with a good big breakfast at the hotel, and rolled out surprisingly late at 0840, without really understanding where the morning had gone. I had my eye on one of two stages: an historical Stage 17 from the 2004 race, or the future Stage 19 from the now-current edition. They were identical but for the penultimate climb, though due to overnight accommodation at the Cullen's place in Annecy, I wouldn't be finishing either until the 3rd of July, so could make the call that morning whether to go via the new or the old route. 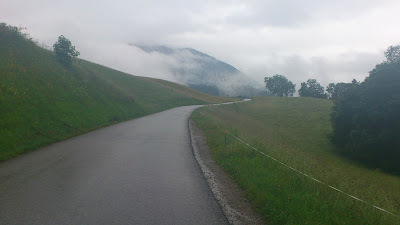 The road was very benign to start with, and as well as being flat, had some great cycling infrastructure. I hadn't always used cycle paths when they were available, but this was a cracker. 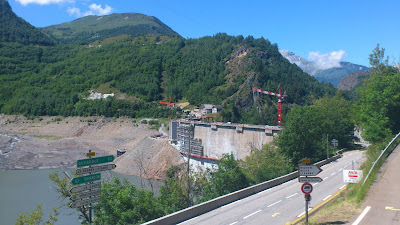 The climb of the Col du Glandon began with an ascent up the face of a dam, at Allemont. It felt quite steep, but I had a hunch it was my tired legs rather than the actual gradient! 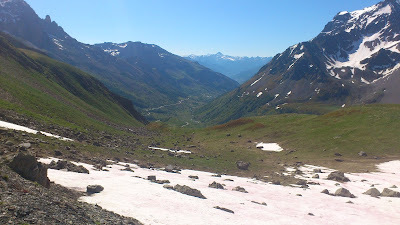 About half an hour into the climb, I was surprised by a short descent to cross to the other side of the valley, and then another. 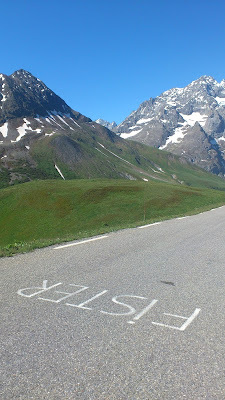 The road-side signage was all about the net ascent, so it was a bit disconcerting to find I'd be repeating some of it! 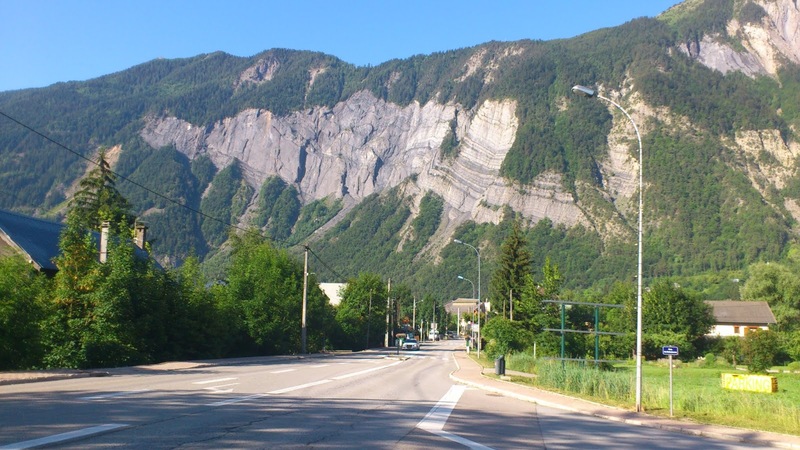 There were lots of rockfall areas with signs pointing out “Mort”. 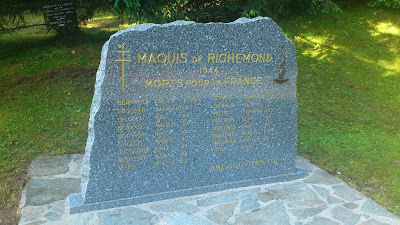 My legs had a bit of a low patch near the top of a steep gully, and I took the liberty of stopping at a monument commemorating the Maquis. I hadn't heard of them, but they were "rural guerilla bands of French resistance fighters" in World War 2. 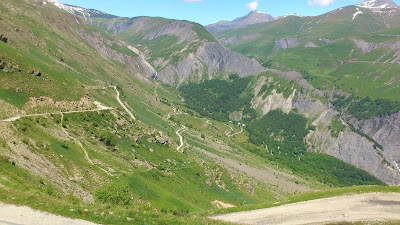 I was a little surprised to read it was a full 11km to the Col de la Croix de Fer, making it about a 30km ascent from the dam. Slightly mind blowing, and a tad concerning!!! 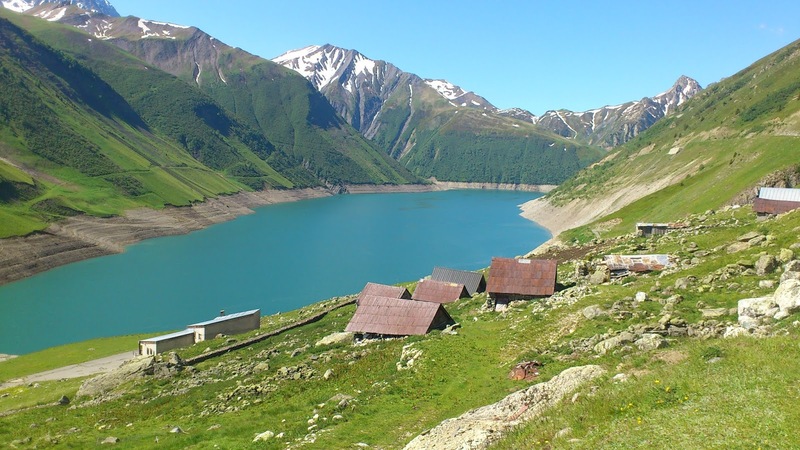 Luckily, the gradient mellowed a lot, especially after the dam forming the Lac de Grand Maison. 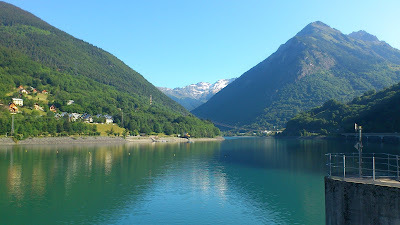 The lake was absolutely gorgeous, and it was hard to imagine more beautiful surroundings. By good fortune, there was another professional photographer on the road side, and boy had he picked a good spot. As I went by, he ran after me and handed me a business card. 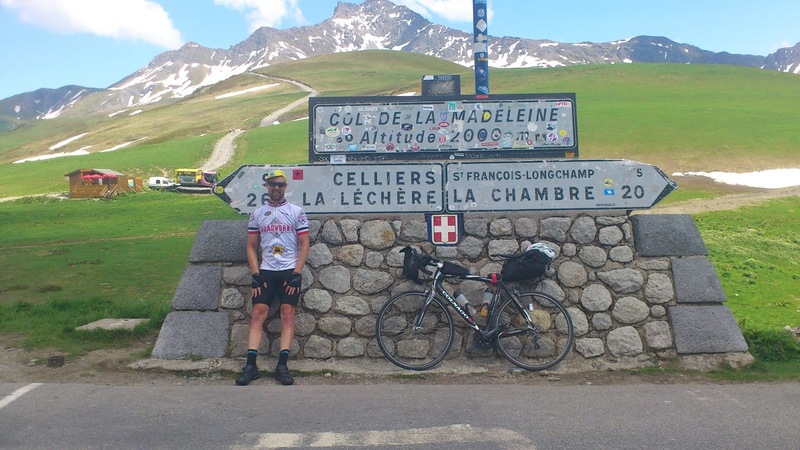 He'd jotted down the date and time, and it was a simple matter of finding the right folder on his website that evening, and forking over a few Euro... A paltry sum for my favourite cycling photo then and since. 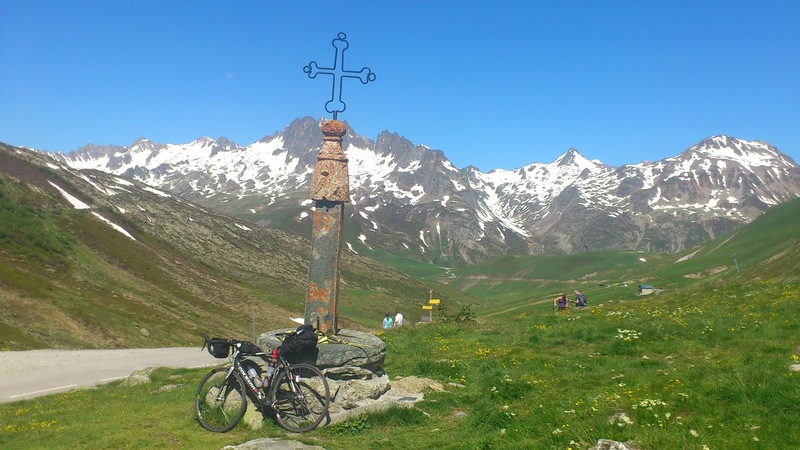 I did a short detour to the Col de la Croix de Fer, admired the iron cross for a few moments, and then dropped back down the way I'd come, with a very short climb up to the Col du Glandon from the main road. 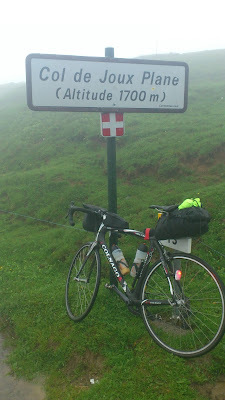 I had a short stop there, and then set off onto a tight and sometimes tricky descent. 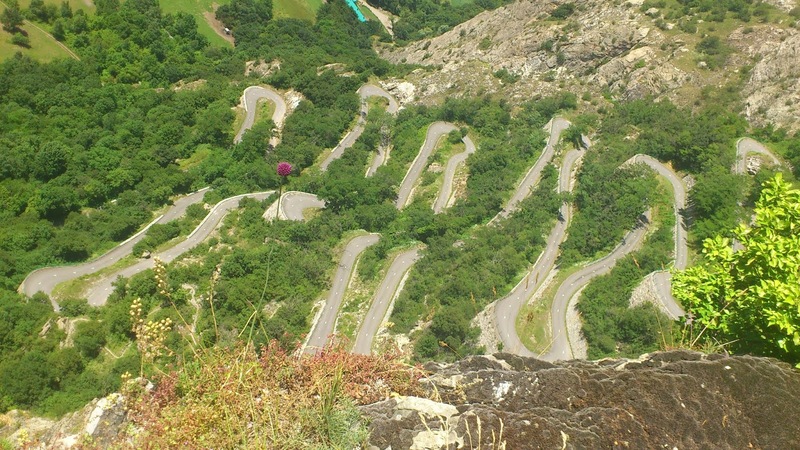 I stopped at the bottom for coffee and coke and then took a diversion to see the Lacets de Montvernier. These were a gift from Sarah - they weren't on the stage route, but she'd found them on a website of cool roads. 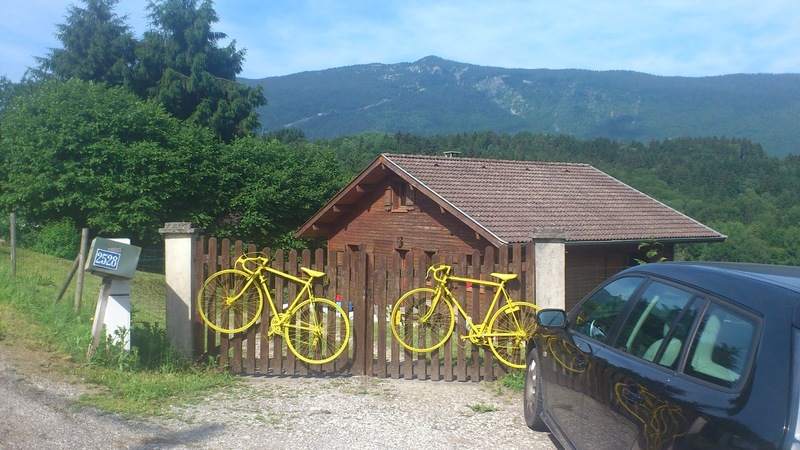 They've since been main-streamed, and were used in the 2015 Tour de France, and are there again in 2018. It proved a little bit tricky to get under train line but it was not an insurmountable hurdle. 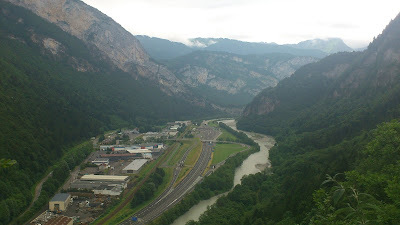 The road was almost invisible from the valley, and consisted of very short straights between switch-back corners with incredible retaining walls and a massive batter. It was very hard to get photos of more than one corner below it was so steep. The road-building effort was something else!! At the top I spotted a likely photo spot. I descended through a paddock, and followed my nose on foot to the top of a cliff. 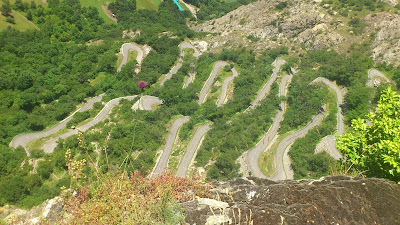 It was a little bit freaky trying to see the road - there was quite a drop, and I hadn't packed my wings!! I dropped back down the way I'd come up, and rode back to La Chambre, where I raided a supermarket for drinks and pastries. 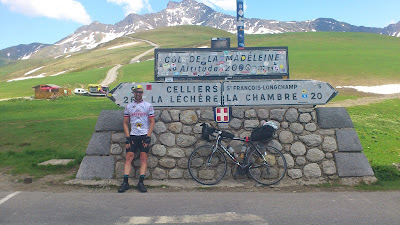 Before leaving, I called Silas to let him know I was about to start the Col du Madeleine climb. I had ambitions of eating an apple on the way up, but found it was nigh on impossible at a gradient of 6%. Rather than inhale a hunk and choke, I stopped after 500m and finished it off! Apple aside, the climb was not too steep, but was very hot work. As I'd done on some climbs, I rode just in my cap, and was treated to lovely views back across the valley to the Glandon. I descended for ages before seeing Silas about 10 minutes from bottom. It was very strange to be following someone all of a sudden, and I immediately started worrying about getting separated or taking a wrong turn! One very fast straight on a super-smooth surface was followed by tight off-camber corner, and I was conscious of a definite change in pace! 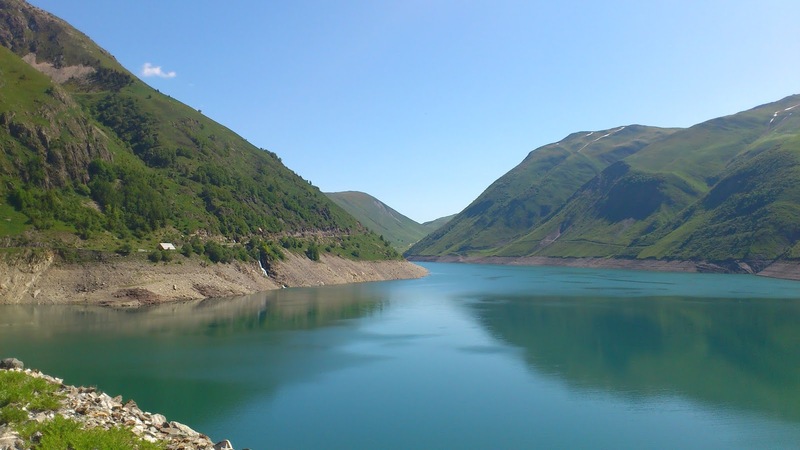 We stopped for water in Albertville, and then continued on the 2013 route to the Col de Tamie. All of a sudden, I realised the heat, conversation and the slight increase in pace, were taking their toll. 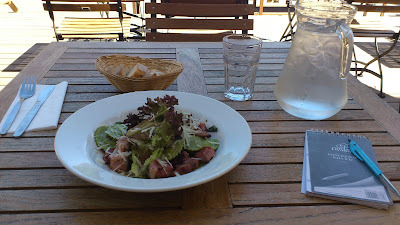 I'd also not eaten in a while, so started to wane! We met a friend of Silas on the descent, and then a guy from Auckland over for L’Etape du Tour. It was mostly flat through to Silas's, and for a lot of it, we were on a great cycle path. First peloton in about 3670km! 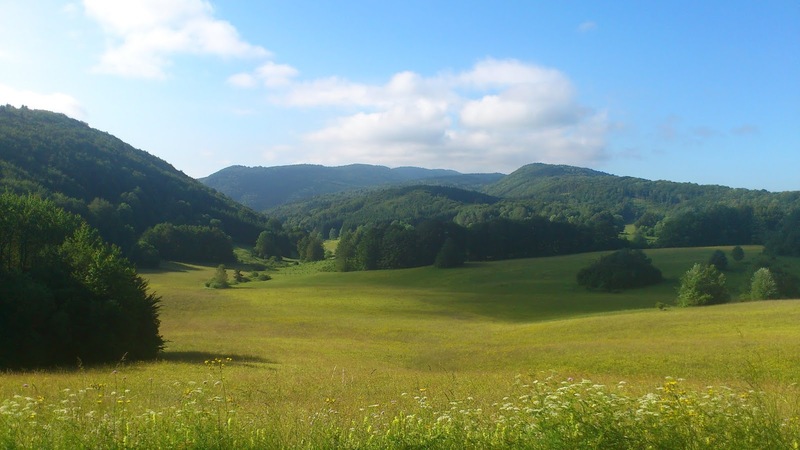 At one point, I couldn't resist a silly sprint, which I regretted when Silas and I rode up the last small hill to his house, and I arrived there feeling quite wiped out! I was greeted by Angela, Isabella and Julian, and they possibly thought "who is this zombie Silas has brought home?!" They had a pool, and it was fantastic to go for a quick dip before dinner, though I did almost lose my bibshorts when diving in - I should have kept the straps over my shoulders! It was lovely to join the family for risotto and salad. I read Snow White and Cinderella to the kids at bed-time, and turned myself soon after. 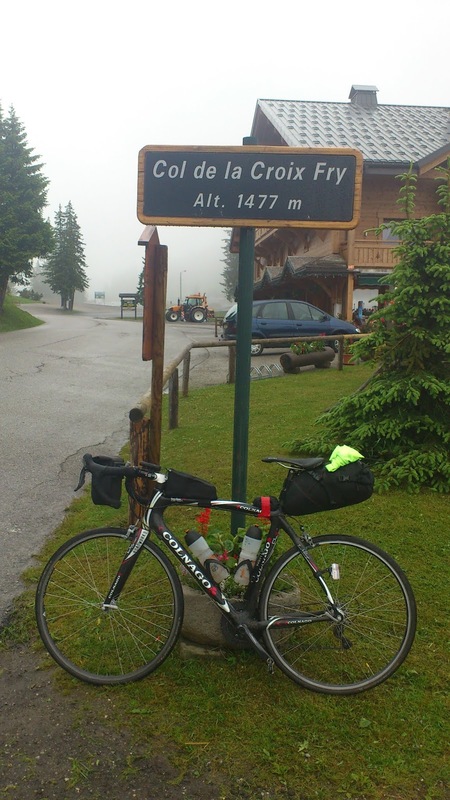 189km ridden, 4260m climbed, 10 hours duration. Two HC and two Cat.2 climbs. 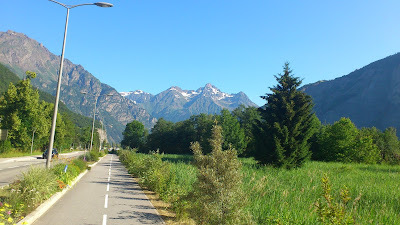 Following my truncated stage on the 28th, I'd decided to cool my heels in Briançon. After checking out the fort up on the hill, I spent the afternoon with my feet up, and it was glorious. Day 20, and my first off the bike! The next morning, I was suited up and ready for breakfast just after 7:15am. There wasn't unlimited food, but I did manage to score some extra bread, and enough for a takeaway roll. I went down for my bike just after 8, and had a brief chat to a nice Italian dude who was in a group that did the Telegraphe and Galibier the day before. He said he’d once ridden Perth to Adelaide, 4500km, through some pretty inhospitable country, I'd say!! It was a chilly start so wore my coat for quite a while. I was glad I hadn't stuck to the original plan of tackling this after Col d'Agnel and the Col d'Izoard. I wouldn't have made it before nightfall, and would have missed the stunning views. The highlight of the road for me was an avalanche shelter that had been built on a left turn in the road. 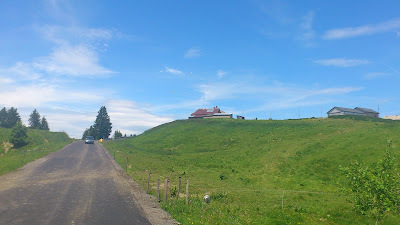 The main route cut the corner slightly, but behind it was a tunnel partially built in the hill. 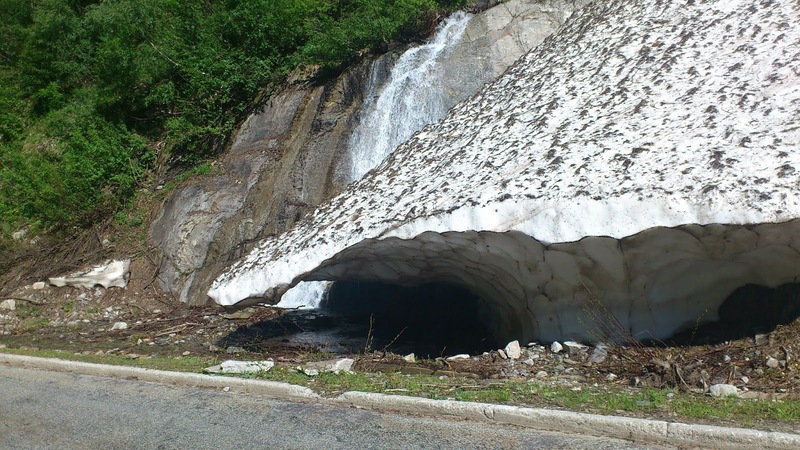 I guessed that in the depths of winter, they didn't bother clearing the main road any more, and instead routed everyone through the tunnel. At the Col du Lautaret was the turnoff to the mighty Galibier - the road steepened, but it was still a very manageable gradient. For a brief moment, I thought someone had anticipated my arrival! "SiFTER" would have been a real hoot! 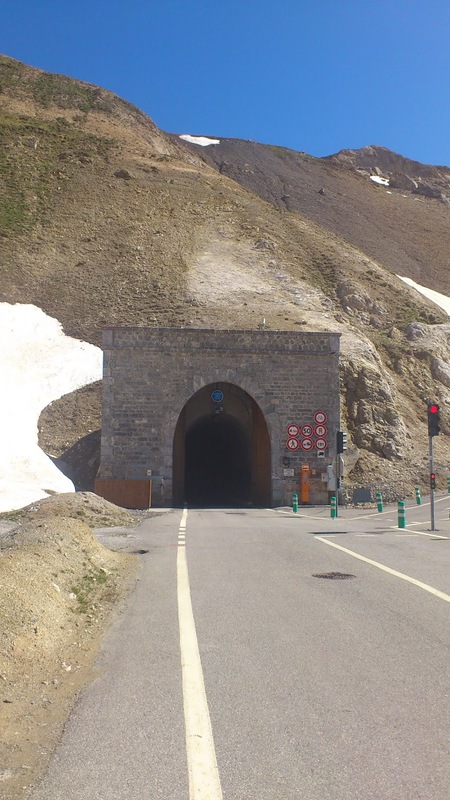 There was a cool tunnel passing beneath the Col, and despite the traffic signs, I decided to do a full loop! Naughty!!!! Just too inviting for this cyclist! On the way up to the Col, was a photographer who appeared to be there just to photograph cyclists. I was wearing my coat, but simply couldn't resist stopping to take it off. I wondered if he got that often! Laughing on acocunt of the wardrobe adjustment! A motorcyclist takes photos of me at summit, and then I dropped down other side after digging out my helmet light. Ironically, in my rush to follow a vehicle on the green light, I failed to turn my own light on, but was close enough behind that it didn't matter. The café at the end of the tunnel was closed, so I dropped down to the main road for a latte. The followed a long descent down a valley. I was happier in the regular tunnels with my helmet light on - the Italian ones a couple of days earlier really hadn't been fun. Initially, I was wearing my coat, fluoro vest, beanie and overtrou, but eventually they got too much and I had to strip off. 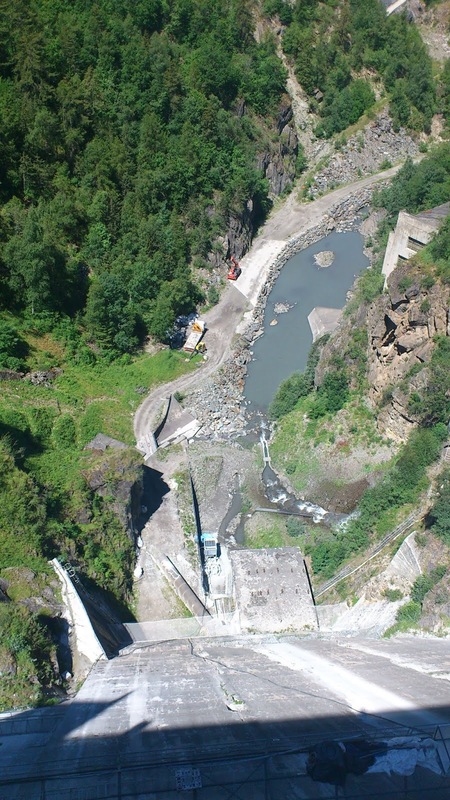 At the bottom end of the Lac du Chambom, they were doing maintenance on the dam. As a result, the lake level was very low, but there was a very impressive drop down-stream. 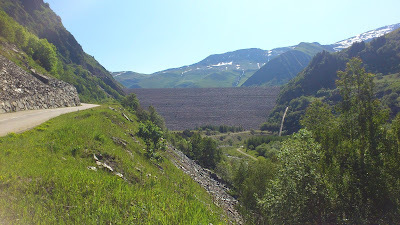 At the dam, I found I'd ridden into the middle of a cyclosport event, and I was careful not to cause any mischief (but did enjoy being towed along at various times). 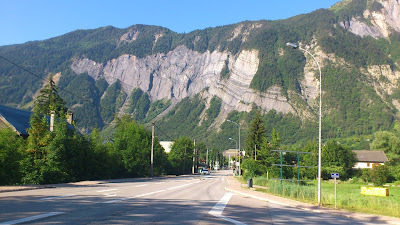 I arrived at my hotel at Le Bourg d'Oisans at around lunchtime. The reception was closed, so I had a roll and a banana, stashed my touring gear under the deck, and rolled out with only a tube and pump on the bike, with a patch kit and my jacket in a jersey pocket. I was shocked the way the bike accelerated away from the hotel like a rocket! The handling was slightly different too, but I didn't notice it at all after the first minute. 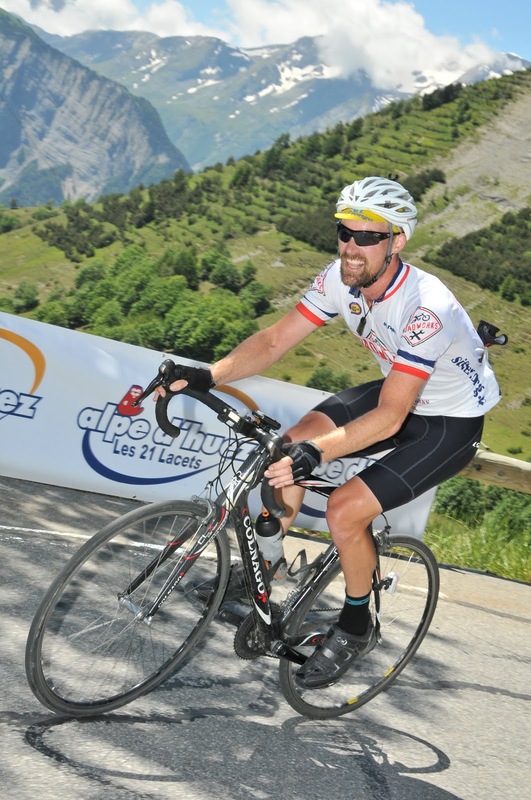 I felt actually really excited to be at the base of the famed Alpe d'Huez climb on a bare bike! 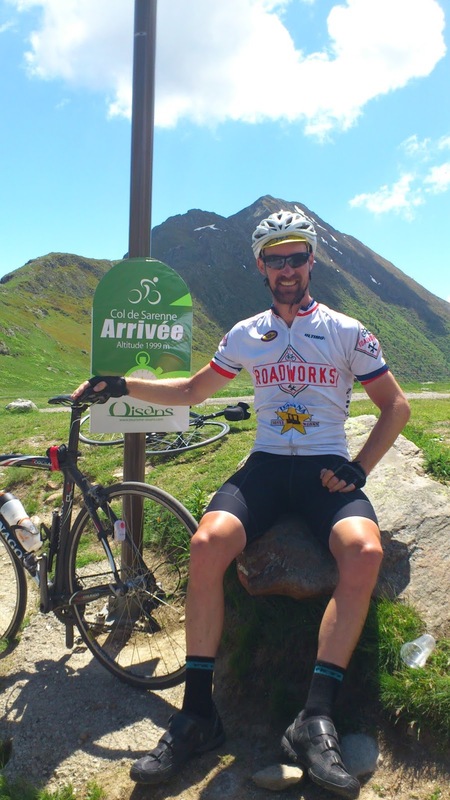 It didn't matter one iota that I'd already ridden 85km, and had been over the Galibier! 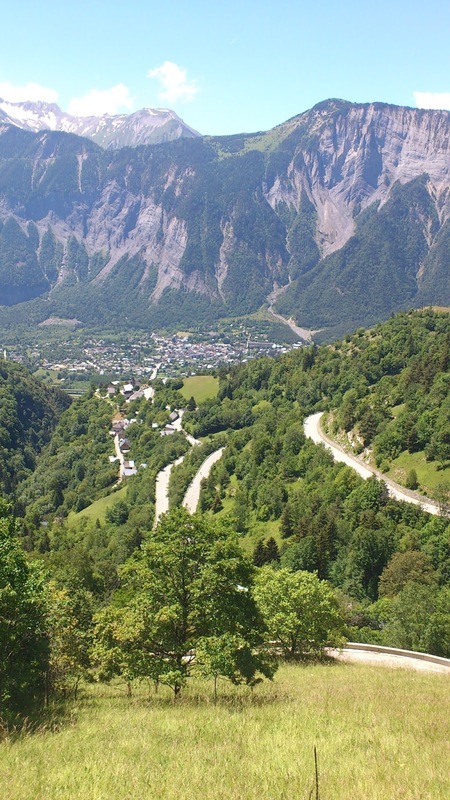 For me, and my relatively recent foray into the world of watching pro-cycling on late-night TV, this was the iconic climb of the modern Tour de France, and I was excited to be here. I started my timer at the kilometre-zero chrono post. This was obviously a climb that people liked to give a nudge! I had 14km to ride, and wondered how close I could get to an hour? My intent was to not stop at all, but had to once the view opened up. 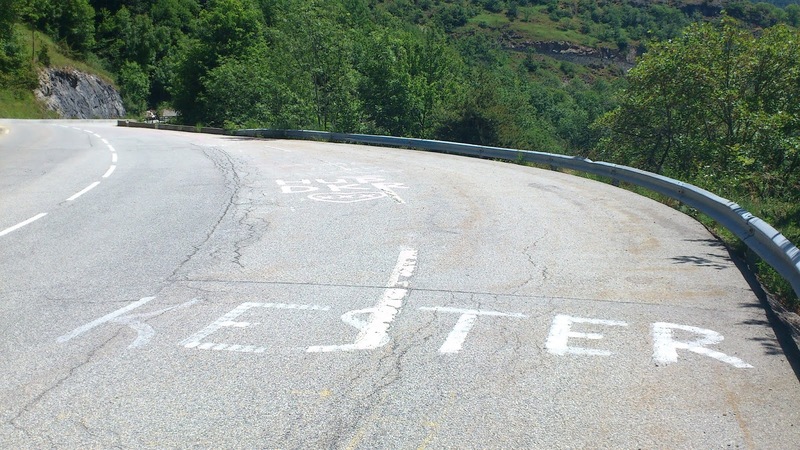 Not long after my first and only stop, I saw “Kester” written on road. I've ridden in Roadworks colours pretty much as long as I've ridden, and to see the (fairly obscure) name of the first-born son of my dear friend Oli written on the road, was definitely not something I could ignore! Oli was very prominent in my mind from that point on. I was starting to tire, and actually swore in frustration when I saw “Harry” and simply had to stop again. I'd been looking forward to the photographer I knew I'd find at further up the road. Michael Flyger's photo is proudly hung on Oli's workshop wall. When I spied the camera, another quick stop ensured my jersey was done up just so. As I rode, I was chewing my way through others like me, but also entrants in the race I'd leeched off earlier. Some didn't take too kindly to being passed! 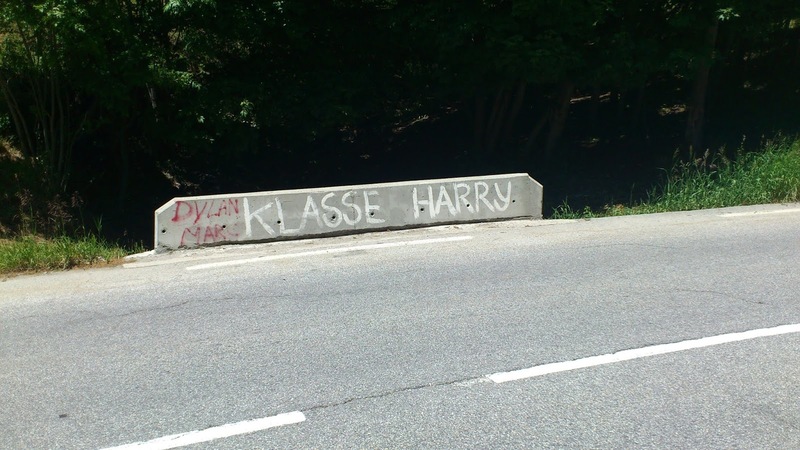 The route was a little bit confusing through the village, so I just followed all the graffiti on the road! Near the very end of the TT course, the gradient eased right off and I really smashed it on the flatter terrain, crossing the chrono finish line just under 59m30. I was pretty chuffed to dip under the hour, even despite the stops, and the time puts me just inside the top 1000 in strava's 18,000-rider strong database. I txted Oli to tell him about the ascent, just as I’ve done after so many races. After catching my breath, I rolled back down to the village for a coke and a coffee. In hindsight should have got some food too, but was too excited after my TT effort – isn't it funny how we focus on round numbers! A few months earlier, I'd have had no choice but to ride down the way I'd come. But, Stage 18 was coming up here, twice, and the organisers had recently had the gravel descent off the Col de Sarenne sealed. It would have been rude not to go and check it out! My legs were obviously depleted, and I was a bit light headed as I made my way up what seemed like a pretty soft Cat.2 ascent of the Col de Sarenne. It was still early in the day, and I had more than enough time for this impromptu loop. 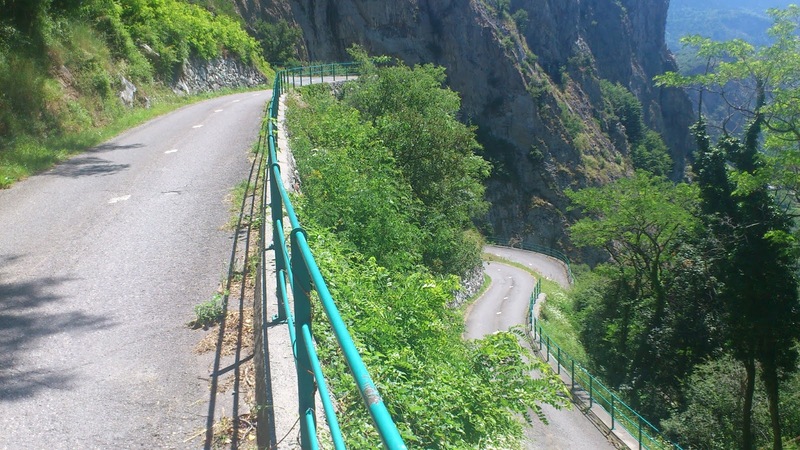 I was very surprised at the roughness of first half of descent, and found it quite hard to imagine the nerve it must take to race down a road like this. The road ended at the same dam I'd crossed earlier, and after an éclair and slice of flan in town, I was checking into my hotel – luckily my gear had been safe in its hidey-hole under the deck. My room had a “full board” which included a 4pm pasta meal! Not only that, but I was able to watch the final 30km of an exciting Stage 2 on Corsica. Before dinner, I chatted to Ashley from Belgium for ages. He was on his way to Provence to attempt to ride up Mt Ventoux six times in 24 hours! His challenge included two climbs from each of Bedoin, Sault and Malaucene. My hat was off to him, that's for sure. It was a busy night, socially, and I spoke with a couple of Scots for a while, before heading off to my room to recharge. 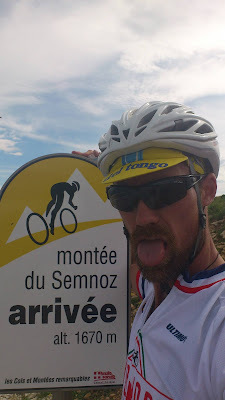 139km ridden, 3150m climbed, 7h45 elapsed. One Cat.2 , and two HC climbs - two beauties at that! 21 days since I left Paris, and I have 3,495km on the clock. 26 June, 2013: To the Alps! 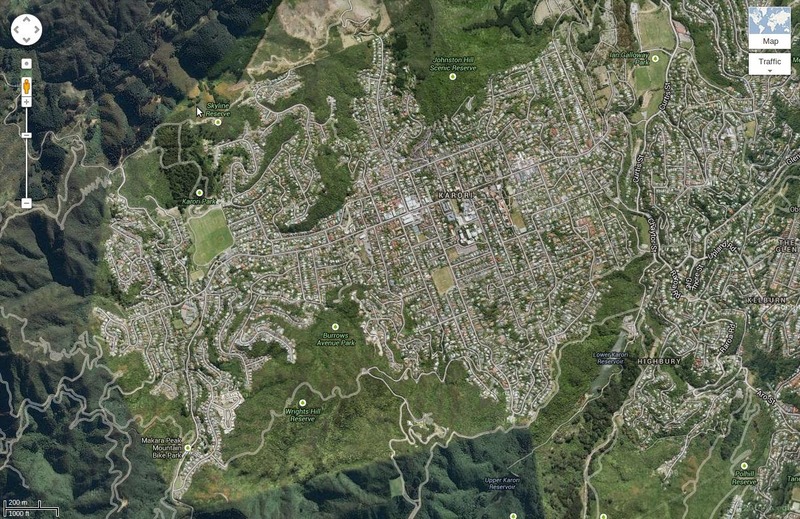 I live, work, ride, write and more in Wellington, New Zealand.